What is your idea of an industrial style home? 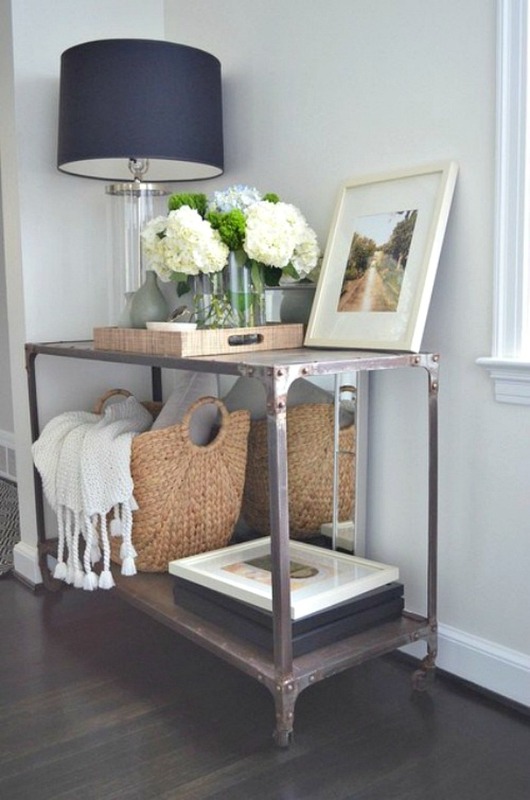 To me, I think of steal hallway tables and wooden boxes turned into coffee tables or foyer benches. Whatever, it means to you it’s a style that is becoming more and more popular with modern designs. There are no longer rules of sticking to one style within a room. You can find shabby chic with industrial touches or modern sleek styles with added industrial lightings. In this generation anything goes together, you just have to find your own style and what it means to you. I love the idea of upcycling and creating home decor that was once something else useful in the past. The industrial lights hanging in kitchen and bathrooms all over the country are my absolute favorite look. I love the look of light rooms with darker furniture like this steel hallway console table below. This entire look would go perfectly in my house if I had a bigger hallway. It really gives that rustic vibe but still ties in nicely with the classy decor around it. 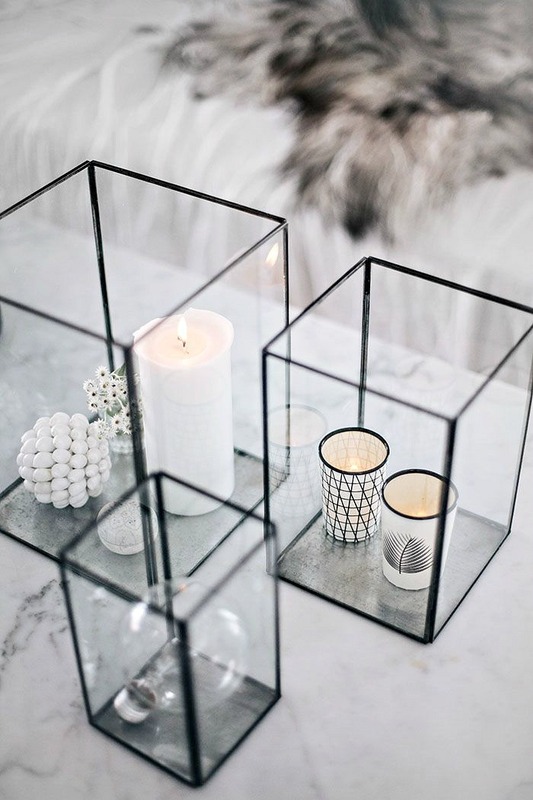 I love glass vases that you can display candles and your favorite ornaments in. The lightbulb in these below give it that industrial flare and the candles create a great ambience for a living room coffee table or side table. I even love bringing a little green and putting miniature plants in these. Green, grays, whites, blacks all tie into the industrial theme. Terrariums are really popular too. I think they fit perfectly in with an industrial style home. The copper ones are on my Christmas wish-list. I can’t wait to incorporate them into my home style. I have so many ideas for my next home. When the kids are all grown up and an industrial style isn’t as breakable to tiny hands and feet. 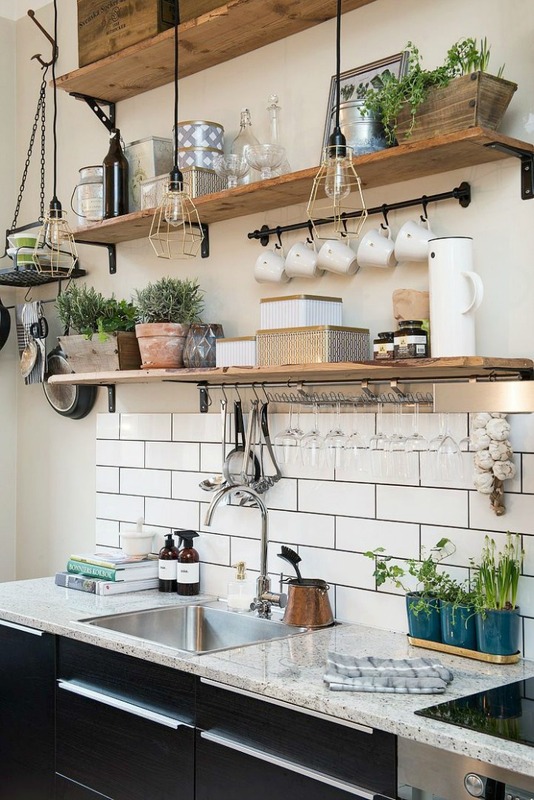 This kitchen below is dreamy to me. I love how plant life spring the shelves to life and your eyes are immediately drawn to the lighting hanging above. It not only provides storage but a display for all your guests to admire. Everything is in reach to while you are cooking away on the stove or washing up. I love wallpaper that makes a statement on a wall. There are so many options out there to match your theme of your room. 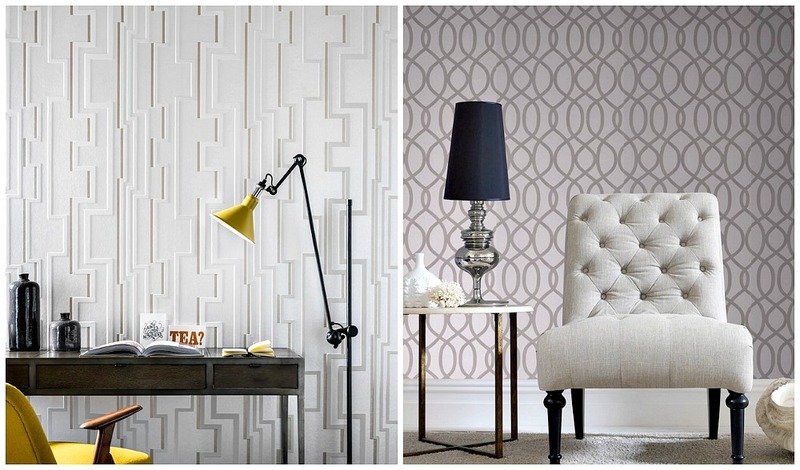 Keeping with an industrial style I would choose a lighter color wallpaper but one with geometric patterns like these two above from Graham & Brown Flock Wallpaper range. Industrial furniture is dark and I wouldn’t want to make a room even darker by going with dark wallpaper. These keep that light shining throughout but tie in the patterns with the sharp edges of the industrial furniture. Check out my Industrial Style Home Decor Board below! Each month, myself and forty-nine other bloggers team up to share our home interior inspiration and are set a different style challenge. This month’s industrial style is my favorite so far. Check out my previous challenges of home interior decorating with style. It really is stylish and sleek and I love how you can mix it all up together with modern and industrial accessories and somehow it all works together. It’s beautiful and one I am working towards for the next house if we move. lol Oh yes it would. Definitely perfect for a cottage. Oh yes I am more of a soft tones and touches of industrial not completely one style. Mixing styles is my favorite in my home. I like industrial style touches at home, especially if they are actual upcycled items. I definitely agree that mixing styles within one room is great. It makes it much more personal. Oh yes me too, I love upcycled items in a home. So trendy and corky at the same time and recycling saving the environment one step at a time. lol Love a good mixed style in a home. Definitely, thanks for all the sound advice. The kitchen is lovely isn’t it? It’s hard if it doesn’t fit the actual house style. I have that problem in our new build with certain styles. I know what you mean. Oh metallic lamp sounds lovely. I know they are awesome aren’t they? I love them for a shelf or coffee table. Just have to wait until my little ones are a little older. I love Industrail, if I had my way we would live in a huge old factory and I would have pieces like all these, but mixed in between would be other styles, as I think it works. Oh that sounds ace. You could do so much with factory space too. I love a good mix with soft tones to make it more inviting.Thanks Kara. Thank you, they really add to the style don’t they? I love Graham and Brown wallpaper. Oh my goodness jealous. I love love Rose and Grey. It sounds lovely. They have some amazing things. Oh yes me too those are my absolutel favorite. I keep pinning glass vases like these on pinterest. Put it up while he is out and then he has to learn to love it. hahaha Joking. It’s beautiful isn’t it? Simple is more these days. It’s a lovely touch for any style home really. I know what you mean I have been getting braver with my wallpaper and loving it. Oh yes I love to soften it. Not sure I could go all industrial without those warmer tones and soft furnishings to help it out. A good mix of the two. Oh I love home decor posts, I just can’t ever translate them into real life! Pinterest is helpful but I am the same I know how I want my house to look but getting it to look like it is very hard unless you have the eye for it. I can put moodboards together like nobody but applying it I am still learning. I keep killing my flowers unfortunately. Boo but trying to keep a few in the kitchen window. Me too, it’s fun to get creative and be inspired by styles and mixing it all up. I dream of my forever home all the time. I do too. Although I struggle to keep them all alive a lot. Oops. I would love to have more around the house too. You and I think alike. I too dream of how my next home would look once the break everything, climb up everything phase of my daughter’s life is over. And I love these modern takes on industrial looks. Though there are sleek lines and finishes, your choices still have a sense of warmth to them! Thanks for sharing, Jenny and for hosting us on #sharewithme! Hope you’re having a great week. I love dreaming of my forever home and what it will look like someday.I love to mix in the soft touches with industrial looks. Makes it more inviting. I really like elements of this style although it’s not something that we have in our home at the moment. I can’t wait until we move and I can start decorating and hopefully I’ll move away from the IKEA filled house we live in at the moment! Oh don’t worry Ikea is amazing too. My house is absolutely filled with it. But I know what you mean I can’t wait until the kids are a little older too and get nicer things. I would love those tiles in my kitchen or bathroom. They are lovely. Lucky you. Thanks, the kitchen is dreamy isn’t it? 🙂 I would love to redo my house but maybe my next one. Thank you for joining in. The wallpapers are amazing aren’t they? I love the patterns Graham and Brown design so modern, sleek and elegant. I love that each house you can start with a new style. I am dying to change my current one but it’s a new build so this style doesn’t always work. I have to have a more mixed style in our house at the moment. It’s easy to get drawn in and obsessed isn’t it? I can spend hours on pinterest every night. It’s time consuming but dreamy. Thanks for linking up. Hope you enjoy the blog hop and to see you again soon. I’m not usually a fan of industrial style, it just wouldn’t fit in our house. But I love those candle holders and the kitchen with all the hanging pieces – I’d love that in our house but we haven’t the wall space. I know I have the same problem no wall space what so ever. I would love wooden shelves and the glass vases are great aren’t they? Sometimes even just the wallpaper is enough of a mix of style to help bring in geometric shapes. It’s great to have simple lines and clean cuts in a home and clear of clutter isn’t it? Thanks for joining in. Vases are beautiful too. I think you, like me, find beauty in all different kinds of interiors. It is probably a good thing I am not a millionaire, as there is a a danger I would spend all my time redecorating as frequently as I change mood… and that would just be too much! Lovely post. hahaha I completely agree. My hubby is always telling me stop changing room decor like I do my wardrobe hahaha I love constantly having change and something different. I would need five houses and decorate them all in various styles. How fun would that be? Love that patterns and designs can be just as much fun as mixing up trends too. Wallpapers from Graham and Brown are stunning. Plants really do bring so much freshness to a room. I just wish mine wouldn’t keep dying on me. lol I love a mixture of industrial and soft touches in between to warm it up. Agreed and no one liked a dull property do they? lol That’s what I love about the forever changing interior trends. I love looking at other people’s houses and seeing their ideas. The thing with living in a manse is that you never know what you’re going to get. At the moment, it’s a three bed detached, but next time?! Who knows! True life is forever changing on us why not let our homes forever change as well. Thank you. Me too, it is surrounded by soft tones for sure. It’s a lovely style for any home.